Before I provide an answer, let’s discuss why students take the PSAT. First, it provides an opportunity to practice taking a standardized test that is very similar to the SAT. The only major difference between the two tests is that the PSAT does not include an essay; whereas, the SAT does. Of course, this brings me to another difference: the PSAT is not as long as the SAT. Next, the PSAT is the only way a student can qualify for a National Merit Scholarship. Let me say that again – the only way to qualify for one of 50,000 awarded National Merit Scholarship is by taking the PSAT. By outscoring other students in your state, your student can become a National Merit Semi-Finalist. To do this, you don’t necessarily need a perfect score. You need to score as well or better than the state index. By outscoring others in your state, you can become a semi-finalist. This opens the door to some worthy scholarships. Third, taking the PSAT provides your student with an understanding of their strengths and weaknesses on this key part of the college application process. Since the PSAT is administered in October of the student’s Junior year, they have lots of time to prepare for the SAT with targeted study based on the PSAT results. Now to answer the question – why study for the PSAT. Taking a standardized test that lasts upwards of three hours not only is intellectually demanding, but emotionally stressful. If a student does not prep and then performs below expectations, when it comes time to take the test that truly counts, the SAT, the student may need to overcome the psychological stigma of not doing well on the PSAT in addition to dealing with all of the normal test challenges. Indeed, when my son asked me this question the other day, I said, I would never enter you into a tennis tournament without providing some type of practice before hand. 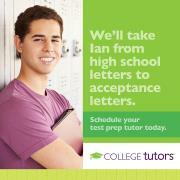 So, go practice to ensure you are setting yourself up for a successful college application process.